A drop cloth is your best friend when it comes to interior painting projects. Every single painting project needs to have some form of drop cloth. In most cases, paint is rather unforgiving and can completely ruin anything that it comes in contact with. When it comes to drop cloths, you have a few options. Here are the most common types of drop cloths available today! If you are one of the many who do not want to spend a lot of money on their drop cloths, you can opt for the plastic option. They are inexpensive and usually get the job done. You also can use them several times before needing to throw them away. You will want to be careful though because they are susceptible to rips and tears. Out of all the drop cloth options, canvas is the most reliable. This is because it won’t tear if you stand on it and it won’t allow any kind of seepage. Also, it is heavy enough that it can be used for interior and exterior painting projects and can be reused for several years. 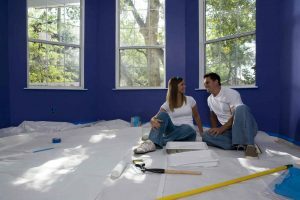 If you were to hire a professional painter, they would most likely be using a canvas dropcloth. The downside to this drop cloth option is that they can be somewhat pricey; however, if you factor in how they long they last, they are an economical option. If you are looking for something cheap that you can just toss once you finish your painting project, paper is a great option for you. Compared to the other options, paper is not very versatile. It also should only be used for interior painting projects. Since it is rather light, it can easily be blown away if being used outside. This style of drop cloth is a combination of paper and plastic. It is a more expensive option than plastic or paper; however, it is cheaper than canvas. It can absorb paint without any leaking and does not create a slippery surface. However, it is not as effective as a standard canvas drop cloth.